When it was announced that Barbra Streisand would perform “final” concerts in California and New York, the advertising tag line was: FOUR LAST PERFORMANCES, TWO BIG CITIES, ONE LEGENDARY VOICE. Barbra Streisand, whose "Timeless" concert in Las Vegas last New Year's Eve established the all-time single performance box office record, will do two concerts at Los Angeles's Staples Center (September 20, 21) and two more at New York's Madison Square Garden (September 27, 28) which her management confirms will ring down the curtain on one of the greatest... and rarest... personal appearance performing careers ever. 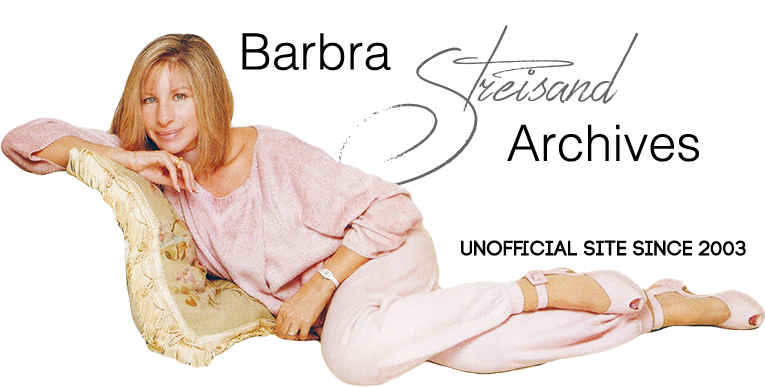 Martin Erlichman, the artist's career-long manager, stated, "Ms. Streisand has chosen to conclude her public performance career in the two cities most closely associated with her work." Seats were priced in four categories: $2,500, $1,275, $375, $150. With hundreds, if not thousands of binoculars, phones, and vocal people who simply couldn't get enough Barbra, the Garden erupted in a huge ovation on Barbra's 8:30 p.m. entrance. "It's so great to be home in New York!" Barbra screamed, the initial outpouring always surprising her. "What a nice way to say goodbye," said Barbra after her first number, just one of many personal observations, unscripted comments, asides, and witty responses to audience shout-outs sprinkled liberally throughout this special evening. Discussing her 1955 Nola Studio session, which her cast re-created, she asked her brother, Shelley, sitting down front, if he remembered. Prior to a gorgeous "The Way We Were," which included her hummed intro, Barbra noticed people turning around to check the prompter monitors and warned that she would be ad-libbing a lot, taking a dig at the press's often critical remarks regarding her use of prompters. Indeed, Barbra was noticing everything, even a woman having difficulty finding her seat, causing her to call out and insert "I love real life" between lyrics. She even deliberately moved to each side of the stage and waved to the upper level seats during the song. So apparently energized and relaxed for the show, Barbra comically improvised, The way we was / The way we were. Highlights and unique moments were abundant—virtually every number. Before "Cry Me A River," Barbra recalled The Lion in Greenwich Village by name (her professional singing debut, June 6, 1960) and admitted to feeling a bit chilly even in her gold shawl, which dancer Mark Mendonca placed around her incorrectly ("Not too high, you're messing my hair"). Wishing she could have filmed these NYC shows, Barbra explained that she had already filmed for TV extensively in Las Vegas (12/31/99-1/1/00), because she didn't think she would do subsequent shows. "Lover, Come Back To Me" ended with a wily final "Nowww" and Barbra playfully suggesting, "I could do anything tonight; they couldn't fire me." After the always beautifully delicate "A Sleepin' Bee," Barbra fondly recalled her earliest songs and how she never forgets their lyrics, enabling her to sing them with eyes closed. Someone yelled out, "Marmelstein!" and Barbra took a moment to explain that she dropped the song "Miss Marmelstein" because she "couldn't really sing it in sequins...I'm not that good an actress...It didn't feel right," but that it would be in her forthcoming TV special. The audience's first standing ovation for Barbra occurred after she surprised herself and the orchestra with a 9-second final "Parade" high note. "I don't know where that came from. It's my last night, I can hold the notes," she boasted. As usual, her Broadway and Movies sections were wonderfully dramatic and moving. Once again, the "Alfie" story broke up the audience, and Barbra added a public P.S. to Michel Legrand (in audience) for the arrangement. Perhaps inspired by familiar faces in the NY crowd, Barbra remembered Broadway, opening nights, and people telling her, "You're never gonna make it, kid, because you're too undisciplined. You never do it the same way twice." She proudly admitted, "I still don't do it the same way twice," which is part of what makes Barbra Streisand such a uniquely talented artist. Segueing into "Evergreen," Barbra's recollection of songwriting aspirations led to someone screaming out "By The Way," and Barbra asking everyone if they liked that song (which she co-wrote with Rupert Holmes in 1975 for Lazy Afternoon). More improvisation resulted from naming her close friend, Joanne Siegel (in audience), with whom she discussed their fathers some years ago. The audience's applause for her friend surprised Barbra, who proceeded to invite Joanne on stage to play piano (of course she didn't accept the offer), because she likes performing in front of people. Next, Barbra wondered how people can enjoy it, since "You have to stand up straight...good posture, holding your tummy in." In contrast, Barbra said she wears sneakers and sweat suits at home, much more preferable. Preceded by a lengthier intro about how Barbra received her father's love poem to a woman before he married Barbra's mother, "Papa, Can You Hear Me?" / "You'll Never Know" and the thunderous Act 1 finale, "A Piece Of Sky," overflowed with tearful poignancy and thoughts of what could have been for Barbra and her dad. Turns out the 92-year-old Esther Posner Grodin ("a little pistol"), who had a two-year relationship with Emanuel Streisand, attended the previous evening's show and had given the letter to Barbra's cousin, Mel Streisand, after meeting him in synagogue. Touching, to say the least. At 9:40 p.m. Act 2 kicked off with a rousing Entr'acte, the wondrous career-spanning video montage during "Putting It Together," and Barbra's absolutely thrilling "On A Clear Day," debuting the offstage Central Baptist Church choir (from Manhattan). In a variation of the piano-player-serving-tea bit, Alec Ledd initiated the conversation, saying he always knew Barbra would make it, and that his real job is running the George W. Bush's presidential campaign. Predictably, Barbra wished him good luck, and after a few beats, added "You'll need it." The Democrats laughed, and the Republicans hoped she'd be wrong. Perhaps to pay tribute to Stephen Sondheim (in the previous night's audience), Barbra returned "Send In The Clowns" to the set list, and, of course, her rendition was remarkable. As the thousands of sun-showering diamond lights poured down on the stage for "Come Rain Or Come Shine," the audience gasped ("Wow! "), causing Barbra to chuckle and repeat, "What a great audience." Barbra altered and extended her comments during the "Duets" video medley, expressing joy over Celine Dion's pregnancy. Erasmus Hall high school even got a mention during "You Don't Bring Me Flowers." She looked for son Jason in the audience during the "Sing" film clip and gushed, "Oh, that face" when his photo appeared on screen. Her live "Crush On You" duet with the Sinatra video was sublime. Barbra's technology monologue led her to comment, "If only our hearts were as evolved as our technology." Before introducing "I've Dreamed Of You," someone yelled out, "I love you, Mrs. Brolin!" Barbra turned to husband James, "Honey, did you hear that? She called me Mrs. Brolin." She told the audience, "I am Mrs. Brolin. I love being Mrs. Brolin." As the music began, Barbra referred to Jim as her "sweet gifted husband." She said, "Some critics didn't like our pictures. They thought it was too sentimental and mushy, but you know, they're not in love." Singing "I've Dreamed Of You" to him, sharing their continued bliss with the audience, proved one of the evening's emotional high points, just as it did on Millennium Eve. In her extended cast and orchestra introductions prior to "Happy Days," Barbra thanked her personal band musicians by name, led by pianist Randy Waldman. She took a moment to thank "longtime friend and manager, Marty Erlichman," whom she met at 19 when his office was just a phone booth on 53rd St. with rolls of dimes. Barbra concluded by formally thanking the audience. She remembered singing "Happy Days Are Here Again" for Presidents Kennedy in 1963 and Clinton in 1992 and said this night's version contained "respect for the past and hope for the future." Not being very political during the show, Barbra did still admit she hoped to sing it and really mean it "if the Democrats win," referring to the November general election. With the choir one step off the floor, Barbra sailed through the ebullient number and remained on stage, bowing and dancing through the orchestra's reprise. Before introducing her special friends and guests in the VIP seats, Barbra asked, "There are Republicans in this audience, right?" which drew ample applause. "Who else can afford these tickets," she quipped. Barbra complimented Rosie O'Donnell for being outspoken on important social issues and thanked Sen. Schumer for his gun control efforts. Stage actress Phyllis Newman's introduction developed into a hysterical brief comedy routine, as Barbra kidded her for winning a 1962 Tony Award over her. Introducing fashion designer Donna Karan, Barbra had the opportunity to clarify that her costumes were self-designed this time around. In Act 1 Barbra wore a sparkling copper-colored pants suit with sleeveless full-neck top, gold chain, and matching shoes. Her Act 2 costume was an elegant long-sleeved, off-the-shoulder, shimmering black sheath, the full-length matching sequined skirt split up the left side to mid-thigh. "Don't Like Goodbyes" really had that something extra from Barbra -- unusual nuance and phrasing -- as did every subsequent song. "I Believe" was as heartfelt as ever, and "Somewhere" soared intro the stratosphere. "Do you mind if I take off my shoes now?" Barbra asked, before changing into heeled slippers to her relief. Beginning her intro to the first encore, "The Music That Makes Me Dance," Barbra introduced Jule Styne's widow and started thinking about New York some more. "Anyone want to buy an apartment in NY?" she wondered aloud, advertising her own Ardsley triplex, which she hadn't visited in a year and a half. "Central Park West, nice view, 15 rooms." Laughter filled the arena. Barbra moved from "Music" 3/4 through to "My Man" and almost literally brought the house down after her final breathtaking "Man" note. Unending waves of applause continually washed upon the stage, Barbra at first admittedly feeling uncomfortable and then succumbing ("It is nice to let it in"). Standing ovations continued for a few minutes, Barbra's eyes welling up with tears ("I don't wanna get ferklempt"). By the end she acknowledged feeling the audience's love. The mood brightened when an enthusiastic fellow reached Barbra's ears with "Barbra, you're timeless!" Her humorous reply: "Why do you think I called it that?" referring, of course, to the show's title. As she explained in detail in L.A., Barbra said it felt like "time to say goodbye to this part of my life" and was excitedly anticipating eating all kinds of delicious high-calorie foods after the show. Speaking of food, she remembered working for the Choy family at age 11, babysitting and taking orders in their restaurant (she gave us spareribs and egg rolls in Chinese). Barbra said she looked forward to upcoming car and boat trips and having "more time to just live life." But, when someone yelled out a particular destination, Barbra repeated it, somewhat shocked -- "Go back to Brooklyn, did you say?" Her discussion about moving into a new phase of her life was a perfect lead-in for the new soft and brief arrangement of "Before The Parade Passes By." Introducing her final concert's final song (which was available exclusively on AOL for a month), Barbra said, "There's a song that's been there for me since the beginning. I've sung it for 36 or 37 years, and I don't look much older than that, do I? ...Here's to old times, new times, first times, and last times." Of course, the finale would be "People," perhaps Barbra's most enduring signature song, which sums everything up. Instead of the pronoun "they," Barbra used "we" in the lyric. Add an urgent spoken interjection, "And we all need each other" after "Are the luckiest people," and the song grows further in social significance. Clearly, this is Barbra's parting message, spreading kindness and goodwill, which is echoed again in her final words to the assembly, "Be good to each other. Goodnight." Celebrity Attendees 9/27/2000: Rosie O'Donnell, U.S. Secretary of State Madeleine Albright, Stephen Sondheim, Marvin Hamlisch, Tony Bennett, Michel Legrand, Bernadette Peters, Sarah Jessica Parker, Drew Barrymore, Penny Marshall, Vince Gill & Amy Grant, Elaine May, Christie Brinkley, Regis & Joy Philbin, Chevy Chase, Martin Short, Ann Hampton Callaway, Eli Wallach & Anne Jackson, Shirley Jones, Isabella Rossalini, Polly Bergen, David Dinkins, Harvey Weinstein, and James Brolin. Celebrity Attendees 9/28/2000: Streisand family including son Jason Gould and brother Sheldon Streisand, Rosie O'Donnell, Lauren Bacall, Barbara Walters, Michel Legrand, Amy Irving, Glenn Close, Martha Stewart, Brooke Shields, Lorraine Bracco, Billy Crystal, Anne Meara & Jerry Stiller, Bud Cort, Billy Gilman, Scott Glenn, Jesse Jackson, U.S. Senator Charles Schumer, U.S. Senator Barbara Mikulski, Peter Bogdanovich, Phyllis Newman, Donna Karan & Steven Weis, Linda Richman (Mike Myers' mother-in-law), Maggie Styne (widow of Jule Styne), and James Brolin (who attended all 10 of his wife's Timeless shows this year). As reported in Billboard, "The top grossing concert of the year came from Barbra Streisand's two sell-outs at the Grand Garden Arena in Las Vegas, which grossed $18.2 million. Streisand controlled the top three boxscores of the year, with the other two being two sell-outs at Madison Square Garden ($14.4 million), and two sell-outs at the Staples Center in Los Angeles ($12.6 million)." Columbia Records reportedly recorded the Madison Square Garden shows for posterity, although they've never been released.